Flashback! 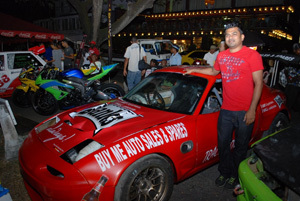 Racer Danny Persaud poses next to his Mazda Miata last year at the Meet and Greet session on Main Street. from the Group 2 and 3 Classes to now campaign in the Group 4 category, a jump that is not only costly, but also a test of your skill and will against the best race car drivers in the Caribbean. Danny Persaud, who drives a Mazda Miata, made such a move and while instant success has not arrived as yet, this young speedster has shown the fortitude and skill that contradict his short tenure in the sport. Currently placed in the second spot in Group 4 of the Seaboard Marine Caribbean Motor Racing Championship points standing, Persaud speaking with Kaieteur Sport yesterday at his garage said he has prepared to the hilt and fans could expect a good showing from him despite the presence of most of the favourites to win the individual crown. “I’ve done some modifications to the car since I last raced and I’m really confident that it will be even faster than the two previous legs I competed in,” Persaud told this newspaper. The easy going racer, who competed in both Barbados and Trinidad and Tobago at Bushy Park and Wallerfield respectively, said work was done to the suspension and cooling system and he is anticipating more reliability and stability in the handling of the car, while it should be able to produce more horsepower as well. With three Guyanese holding the top three positions in the points’ race, Persaud said the country’s chances of retaining the title are great and urged fans to come out and lend vocal support to the team. South Dakota is the venue for what has traditionally been regarded as the biggest Meet in the CMRC.